Master the basic technique of cooking risotto and you can enjoy endless combinations of flavours. The key to success is choosing the correct rice. Use an Italian risotto rice such as Riso Gallo Vialone Nano Risotto Rice or Carnaroli Risotto Rice: both have excellent absorption qualities. 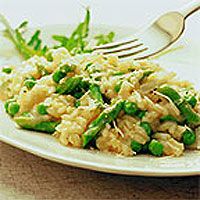 Early summer, when fresh peas and the last of the English asparagus are available, is the perfect time to make this risotto. Bring a small pan of water to the boil. Add the asparagus tips and peas to the water and return to the boil. Cook for 2-3 minutes or until just tender. Drain thoroughly in a colander, reserve and keep warm. Meanwhile, in a separate pan, heat the stock for 4-5 minutes until almost boiling. Cut the onion in half and peel, leaving the root intact. Chop the onion by cutting thin slices from tip to root, stopping just before the root. Then firmly cut thin slices through the height of the onion, at right angles to the first cuts. Discard the root to leave a finely chopped onion. In a large sauté or frying pan, heat the oil over a medium heat. Add the onion and cook for 2-3 minutes until the onion has softened and is translucent, but not browned. Add the rice and cook for a further 2 minutes, but take care not to allow it to colour. Ladle about 3-4 tbsp hot stock onto the rice. Bring to the boil, stirring continuously with a wooden spoon. When the stock is absorbed, add the next 3-4 tbsp hot stock. Ensure each addition of stock is absorbed before adding the next. Stir continuously. Keep adding stock for about 15 minutes until the rice is tender. You may not need all the stock. Gently stir in the butter until it has melted. Take care when stirring risotto - although it should be stirred continuously, it should not be mixed too vigorously. The aim is to have individual grains of rice that are cooked and tender yet hold together. Over-stirring will cause the rice grains to break up and become too sticky. Finally, add the cooked asparagus and peas and mix through gently. Then add half of the grated Parmigiano-Reggiano. Season to taste. Serve on warmed plates with the remaining grated Parmigiano-Reggiano and a simple salad of roquette leaves. Use a wide pan as this will allow more of the rice to come in contact with the heat, letting it cook quickly and evenly. Stir with a large wooden spoon or spatula, as this is less likely to break up the rice grains than a metal spoon. The flavour of the oil could easily overpower the stock and vegetables. Use rapeseed or grapeseed oils which have delicate flavours. Vegetable stock can be used in this recipe as an alternative to chicken. Stock made from stock cubes can also be used in place of fresh stock. If you do use stock cubes, taste the cooked risotto before adding any seasoning, as there is usually some in the stock. You can use other ingredients instead of asparagus and peas such as cooked chicken, smoked fish or seafood. Prepare and cook the ingredients separately and add them in after the rice is cooked. Take care not to overcook at this stage. If you would like to make a risotto from scratch but don't have enough time, look out for the Riso Gallo Risotto Pronto Range with new sun-dried tomato plus saffron and mushroom flavours. It can be ready in 12 minutes. This recipe was first published in June 2002.